The Ultimate Sales Machine by Chet Holmes is packed with tactical tips and strategical insights about how to grow your business. Below I share my favorite principles from the book. I highly recommend buying the book though, there are a lot of golden nuggets to be found I don’t cover in this post. Spend at least 2.5 hours growing (cold calling, making deals, selling). Chet says that every small business and entrepreneur needs to spend at least 2.5 hours a day on growing the business. These are often tasks that are tough and therefore easy to neglect. Especially for introverts and “entreprogrammers”. How many hours a day do you spend calling customers? The picture shows the distribution of the customers in the purchasing cycle. As you can see, only 3% are actively buying your service right now. Imagine that you are writing the headline for a workshop,webinar or newsletter you offer potential clients. You want the headline to appeal to as large portion as possible of the pyramid. Headline 1: “The Five Ways Our Office Equipment Can Help You”. This headline only address the top of the pyramid “looking to buy” and maybe “open to buy”. Headline 2: “The Five Ways You Are Wasting Money in Your Administration”. Not the most exciting headline, but the whole pyramid is much more likely to want to know more. Using product data instead of market data might be one of the most common mistakes businesses do in their copy-writing, presentations and pitches. “10 new recruitment companies are started every year targeting students. At the same time, the number of technical students graduating every year have been constant for the past five years. Market research shows that recruitment of technical students will account for more than 70% of the total recruitment market within 2 years. To survive this highly competitive market it’s key to attract technical students”. “Our site has over 2000 technical students registered”. Which data set do you think is most powerful? 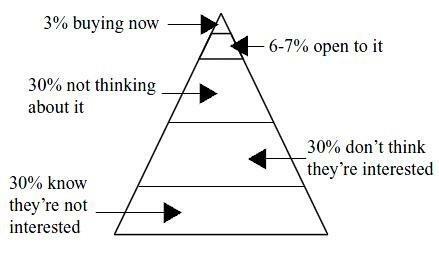 Which information targets the biggest part of the pyramid? This principle is applicable in presentations and long-form information products (books, e-books, newsletters). If you read the book you will notice how Chet continuously sells the chapters yet to come. This hooked me as a reader. When was the last time you pre-sold a slide in your presentation? Never Thank Clients For Their Time. Never Apologize For Taking Their Time. [thanking for a clients time] shows that you consider their time more valuable than yours. It suggests that listening to you is far less important than other things they could be doing. You feel so lucky to have the meeting with an impressive person you can’t help yourself. I’ve heard myself say it so many times: “Thank you for taking the time to meet with me” – Uuugh. Chet has an example in the book. A former colleague of his was selling a service to lawyers. He would start off the meeting saying: “The first thing I want to do is apologize for taking your time. I know you charge for your time, so this is valuable time for you.” It was straight uphill from there. Being turned down is probably the least pleasant thing we experience in our privileged every day lives. In sales, though, being turned down is a natural part of the process. Much more natural than not being turned down, actually. So, how should one handle a “no”? This feels counter intuitive, right? Someone just told you that they’re not interested. Why not move on? Constantly and intensely follow up a no with creative gifts and calls. Or, it could happen, as I’ve seen 100 times, that you keep following up and one of their preferred providers lets them down in some way and, wham, you are the first company they think of because you never gave up. How to follow up is key of course. You don’t want to waste peoples time and act selfishly. It’s tough to make decisions, sometimes the client need help. I finally said to him: “Look, you don’t need any more information. You already know as much as you’re ever going to know. You just need to make a decision. Do you have what it takes to make the decision? Because that’s where you’re at right now.” That’s a hard-core close, but without it he might have continued wasting his time struggling over the decision when he could have been working with me to improve his business. He said: “You’re right. I do know. I want it.” And he bought. I have a tendency to feel pushy when I do this, and therefore avoid it. I might tell myself that “I’m too nice” to push a sale. But I think the truth is that I’m to scared of being rejected. If you believe the customer needs what you are selling, then doing everything to get it in the hands of the client is your job. It should be easy for the customer to buy. You don’t want friction. How can you decrease or eliminate the risk for your customer? Customers has objections. Maybe the thing you are selling is too expensive. Maybe it’s the same information can be found for free. You can address objections differently depending on the medium of communication. Agreeing with the objection is useful in two-way communication (Phone, Face to face, email). Isolating the objection is important to structure your arguments. You need to know what the problem is in order to solve it. This is a way of eliminating variables. “At this point, if there are more objections, they will surface. If not, the client will say, “No, if I could afford it, I’d buy it.” This is called isolating the objection. If you are writing a sales page or sales letter, addressing the objections can be very powerful. If you do it in the right way the customer wont have any objections when getting to the bottom of the page. First — if you liked the post — then go buy the book. When was the last time you pre-sold a slide in a presentation? How can you decrease or eliminate the risk for your customer in the buying process? This picture has absolutely nothing to do with the article. I just find Japanese (?) architecture impressive and soothing. Do you want to become a best selling author, get a 6-pack or make $5-million in 7 days? I’ve been follwing Ramit Sethi for over a year. He sends me a lot of email. I searched for “Ramit” in my inbox and found more than 500 emails. Is it possible to send that much email without being a spammer? I think it is and it’s simple, but not easy. The key is to ALWAYS deliver value. Ramit always shares an anecdote, a lesson learned or a joke. He also sells his courses like a mthr-fer, but that’s okay. Below are 8 things I’ve learned from Ramit the past year. You can negotiate anything. Your phone bill, your mortgage and the price of your clothes. Negotiation is a science, or according to some – An art. The most important part of negotiating is having the guts to do it. If you try negotiating you’re already ahead of 80% of the people. Remember that negotiation is a skill. It’s something you can practice and become better at. To become better at negotiation follow these 2 steps. Start negotiating – Go down to a local farmers market and try to negotiate the price of a cheap shirt or an apple. Don’t be rude, have fun with it. Become incrementally better – Read the book Influence, read James blog post and browse Ramits tactical tips. Then repeat step 1. BONUS CHALLENGE: Next time you go to a coffee shop, ask for 10% off. Don’t give a reason. Don’t be rude. Just say “could I have 10% off?”. If they ask you why tell them “I just would like to pay 10% less”. Ramit does not accept any customers with credit card debt. According to him it costs him hundreds of thousands of dollars every year. “Look, this is not for everyone. If you are serious and what to commit and have astounding results, go ahead. Otherwise, feel free to browse my free content”. There are a couple of reasons why this counter intuative advice makes sense. Scarcity – It makes the product (in this case an online course) feel more exklusive. Credability – If he can afford to turn down customers he must be really good! Integrity – Ramit has a background as a personal finance blogger. Putting people deeper in the hole does probably not converge with his values. I was at a meeting with a great salesman when I was 21. He was older than me. Maybe 26. Me and my friends were trying to start a company and wanted to sell our services to him. I was in the middle of a nervous rambling about our idea when he reached inside his jacket and braought out a pen (This was pre Wolf Of Wallstreet). Then he taught me a lesson. “Is this a pen you think you would want to buy?” He interrupted me. I did not want to give him my money. We were both quite. After a while he smiled and took back the pen. There is always a discrepancy between what we say and what we do, what we want and what we say we want. Watching what people do does often give you more valuable data than asking them. Copywriting is an underestimated super power in the online marketing sphere. The reasons copywriting is so powerful are threefold. 1) Scale – If you are a great telemarketer you can call 20-30 people an hour. If you are a great copywriter you can reach, well, a lot more people. 2) Wide applications – Copywriting can be used as a swiss multi-tool. Coywriting is the tool to use if you want to increase email signups, email opens, email clicks, sales. comments, recommendations and responses on OKcupid. 3) Returns over time – If you invest in better copywriting the effect lasts for years. See the example below. 1,5% sign up -> 1500 signups/month -> 18000 signups/year. Did your mouth fill up with saliva? Maybe it’s just me. Anyway, you don’t have to be a good writer to be a great copywriter. These are two different skills. There are copy-writing frameworks you can use to go from clueless to a copywriting PRO. 1) Find the voice of the customer – Use words and phrases your targeted customers use. Go out and find these words. 2) Be specific – Make your copy as concrete as possible. Example: “I’ll help you become more efficent” vs. “Want to spend more time with your kids? I’ll help you save 5 hours a week.”. 3) Don’t talk about yourself – Don’t talk about your features. Don’t talk about your story. Not until you have talked about the customer. I cover these points to a greater extent in this post. With all the free material that is out there, can you really make money selling online courses? Well, Ramit can. He can make 5 MILLION in one week. Ramit often says that his biggest mistake was to not create his email list earlier. There are a number of reasons for this. Reach all your subscribers You own your email list. You decide who the emails go to. Most social media sites have algorithms that filter the content for the users. In some cases you might just reach 10% or less of your followers. Easy to track – There are great tools for using and tracking email. I like mailchimp. Timeless technology – Email has been around for 50 years. To signup to social media sites you need an email address. It will be around for quite some time. The hell-zone is products in the $1-$50 segment. Customers are price sensitive and generally has a higher probability of asking for refunds. You also need super high volumes to make it work financially. What can you do with this today? Pick the topic that interests you the most. Then write down 3 ways you can use the knowledge in your life or business. What if I told you there is an optimal number of characters for your headline you can start using today to increase open rates with MORE than 50%? I’ll tell you what. Then I’d be a liar. A liar who knew that’s exactly what you want to hear. I’m sorry but I can’t give you that number. Neither can anyone else. But I can give you something better. I can give you a system. You know how you get some questions over and over again? The answers are: No, it does not matter and 6.5” thank you very much. How do I get to know my subscribers? How do I give them value? How do I write a great headline? These are the questions I will be answering in this post. I’ll give you detailed steps you can follow to answer each one of these questions. Then I’ll show you how I’ve used them to CONSISTENTLY get +50% open rates on my lists. 1.a) Who are your subscribers? It’s possible to segment the subscribers in an infinite number of ways, which is a subject for another post. The point is to start thinking about who you are writing to. Then you can get INSIDE THEIR MINDS and make them open your email. However, there’s no need to get fancy just yet. I’m sure you already know some things about your subscribers. Maybe you have customer data from your business or you can make a good guess based on your industry/content of your website. Estimate the following parameters for your subscribers, a simple profile will do fine for now. Nationality: 80-90% Swedes – Typical rate at the school. Occupation: Diversified, full-time employees – The kind of people who can get a mortgage. Nationality: 100% Swedes – The opt-in is in Swedish. You don’t have to write it down. But it helps. We will use this simple data to get more specific later. Then I will show you how to read minds. I know you want to learn that so for god sake please continue reading. 1.b) What are the subscribers thinking about? It’s easy to know what your reader is thinking. All you have to do is to read her mind. Do not worry my dear aspiring email-writer. I will teach you how to do it. There are three methods you can use to systematically read minds. A persona is a generic example person from your subscribers. We’ll create our persona from the previous step. All you have to do is elaborate on each data point and you got it. Hanna is 23 years old and is studying her third year on the program Industrial engineering. She is from a small town in Sweden and moved to the capital Stockholm to start her studies. Once we have established a persona for the subscribers it’s easier to GET INSIDE THEIR MINDS. Simply ask “What is Hanna thinking about?”. Then try to think about the answer. Thinking is a rare and underrated quality. If you feel stuck, try to think about what is going on in the persons life form different perspectives of time. At this point in life: Did I choose the right education? When will I get rid of my student debt? What career will I go into? This year: Where should I go to vacation? What master program should I choose? Which internships should I apply to? This month: What food should I make for Easter? When do I need to do my taxes? How will I get this small salary to last all month? Now we have a solid base to work from in the next step, giving your readers value. If you need more help with ideas about what your readers are thinking about, read the two paragraphs below. I’m writing an article and if you can answer one question that would help me a lot. “Tell me three things you are worried about this month and/or this year”. If you want to avoid direct integration with humans, send out the following email. I want to write an amazing article and need your help. If you could reply to this email with an answer to the following question that would help me a ton. Of course I’ll send you the article when it’s done. What if you don’t have any friends, family or email subscribers? First, stop reading this and go do something with yourself. Get a daily practice. Then comeback and continue reading. Maybe you are just starting out and don’t have access to anyone. Then think about where your targeted audience hangs out. Both online and offline. Online can be forums such as reddit, news-sites and blogs. Take a look at the popular threads and stories. Those topics will be things your future readers are thinking about. Find offline sources too. Go to meetups. Go to fairs. Go to seminars. Go where your audience are. 1.c) What are they expecting from you? If you have a list with subscribers you have expectations from those subscribers. The readers might be or might not be aware of these expectations. To get an idea of what your subscribers are expecting, answer the following three questions. I) What does your Opt-in say? If your opt-in says “Monthly updates”. Don’t send emails every week. If your opt-in says you are going to send them an amazing guide of something, make sure you send it. And make sure it is amazing. II) What style are they expecting? If the content on your blog/website is dense and long-form. Your emails should be too. Or refer to texts of that nature. If you run a B2B site and your articles are formally written and very technical, follow that pattern in the emails. III) What topics are they expecting? You probably ask different friends for different things. I do. I have one friend who knows everything about sneakers. I ask him about sneakers. Not about programming. If your site is about dog training, your emails should be about dog training. Or how other topics relate to dog training. If you want to create things in a large set of categories you can do two things. II) Set up multiple sites for the different themes you want to address. One site for creating a business, one site for learning spanish and one for travel. Now you are a fully trained jedi-mind-reader. Let me show you how to put your super powers to good use. How often are you eager to open an email? My guess is, not that often. Maybe 0,5% of the time. Let me show you how to become that 0,5% in the inbox. Try to remember the last time you kept updating your inbox to see if an email had arrived. These emails contains (hopefully) incredible amount of value. Life-changing value. And they are also feedback from an action you have taken. You are CURIOUS to see the reply. This is basically impossible to match with an email that is not a reply (Since all people care about are themselves and their agenda). However, we can use the extreme cases to learn how to build our emails. Of the hundreds companies and people who email you every day, how many give you something of value? How many talk about themselves and their new updates? This was a short email sharing tips for doing taxes which was due the same month. I new this was a topic all of the subscribers worried about and had TOP OF MIND. These tips was super valuable for the list. Notice how important the timing is. The same email sent in the middle of the summer would have performed awfully. Look through your mind-reading list and look for something your subscribers are dreaming about. The more concrete the better. I used this for a weekly update from a job-board-site. Who does not want to see jobs they have been matched with? This appeals to the dream of being found by a dream employer. And also, super valuable. I once sent out an email that got 500 people to unsubscribe within fifteen minutes. Want to know what headline I used? Of course you do! You are just as curious as everyone else. Headline: The 3 worst courses at [school name], do you agree? The headline was “The 3 worst courses at [school name], do you agree?”. What student would not be curious about this? If you are wondering how I came up with that headline, I’ll tell you right now. Open rates are clicks. Clicks on your headlines. You want to make it IMPOSSIBLE for the reader to not hit that touch pad. There is a simple system for this. I’ll cover it briefly here and if you want to read more about it I recommend you check out the site Psychotactics. They have some great free content on this topic. The goal is to integrate as many of the three following points as possible in the headline. Use a question, hide information and problematize. There is research to back this up. But this post is already running too long so you’ll have to take my word for it. 3.1) Use a question Straight forward. A question creates an incentive for the reader to take action. If you’ve found anything useful in this article, please don’t let it slip away. Use it. Today. Something small and simple. Think about what your readers are thinking about. Challenge: Use one of the ideas I covered next time you write something. A newsletter, an article, copy for your website or a power point. Then email me at hello@mannelarsson.com with the results. I read and reply to everything.